Chameleons and geckos are both tropical and sub-tropical lizards that are popular as pets. Although they share several commonalities, each species has its own unique traits that make it easy to tell apart from one another, as well as from other lizard species. In addition, although the range and habitat of each species have some overlap, the gecko's native habitat is far more widespread throughout the world. Reptiles are cold-blooded, lung-breathing vertebrate animals characterized by horny or scaly skin. The class Reptilia is divided into three distinct orders: Chelonia, which includes turtles and tortoises; Crocodilia, which includes crocodiles and alligators; and Squamata, which includes snakes and lizards. Lizards are further subdivided into two groups, Iguania and Scleroglossa. Geckos and chameleons both belong to the Iguania group, which includes reptiles with sticky tongues that are used for catching prey. Geckos are small to medium-sized lizards belonging to the family Gekkonidae. There are about 1,500 different species of geckos throughout the world, the largest of which is the tokay gecko of Southeast Asia, which reaches lengths of up to 14 inches. Geckos are characterized mainly by adhesive pads on the undersides of their feet that allow them to cling to smooth surfaces. Another unique characteristic of geckos is that they are the only family of lizards to possess a voice. Chameleons are also small to medium in size, and belong to the family Chamaeleonidae. 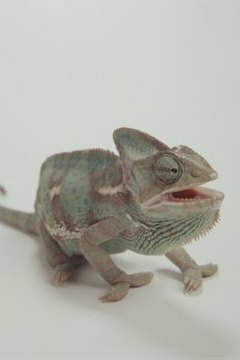 Chameleons are easily identifiable by their flattened bodies and buldging, independently rotating, conical-shaped eyes. Their primary unique characteristic is the ability to change the color of their skin to provide camouflage, although they share this trait with the American anole, which is sometimes referred to as the American chameleon, despite belonging to the Iguana family. Chameleons have hands and feet designed for grasping, and long, prehensile tails. They tend to move slowly, grasping onto branches as they go. Geckos are found throughout Southeast Asia and the West Indies, as well as throughout the Mediterranean. In the Western Hemisphere they're also found throughout the Caribbean and parts of North America, primarily in Florida and the desert regions of the southwestern U.S. and Mexico. Many species are arboreal, meaning that they live in trees, while some prefer to make their homes in human dwellings. The Chameleon family includes more than 150 species distributed throughout the Mediterranean, southern Europe, South Asia and sub-Saharan Africa. Chameleons are also arboreal and tend to live primarily in jungles and tropical forests.